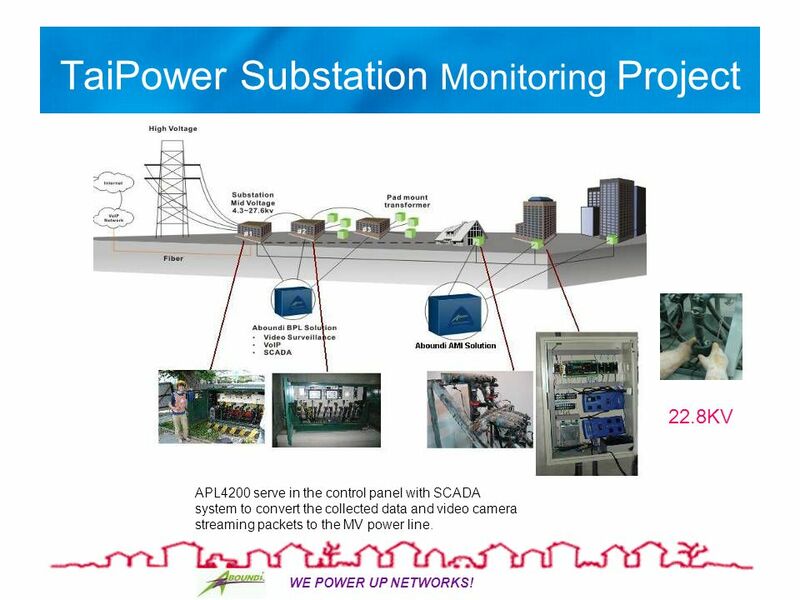 WE POWER UP NETWORKS! 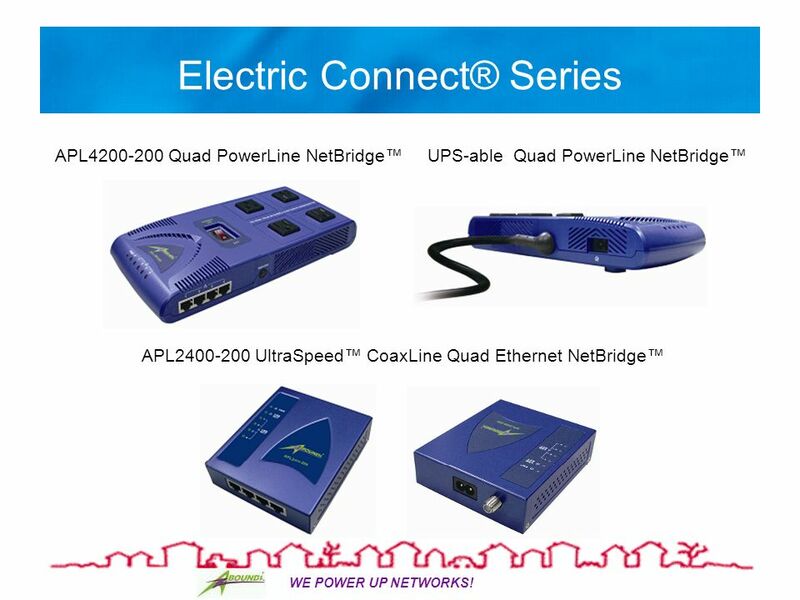 Electric Connect® Presentation for 12/17/2009 Joint MTT-S / Life Member Affinity Group Meeting. 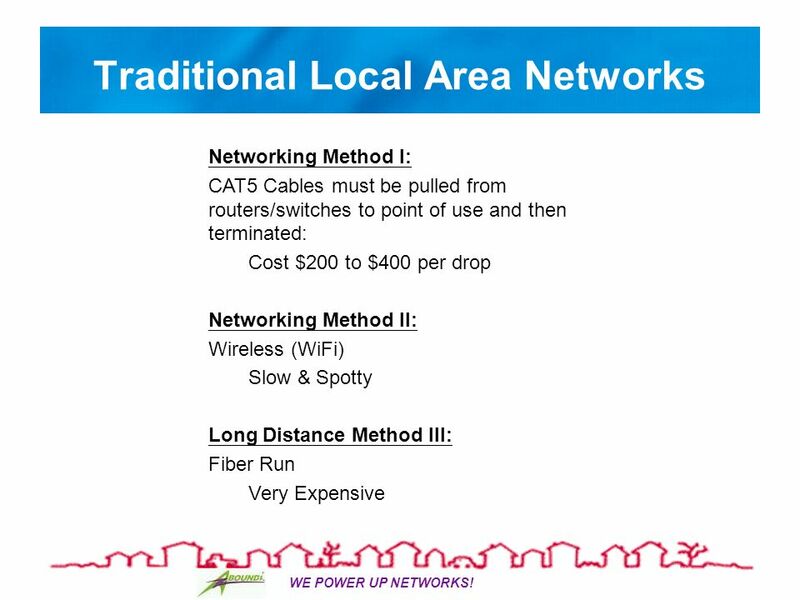 4 WE POWER UP NETWORKS! 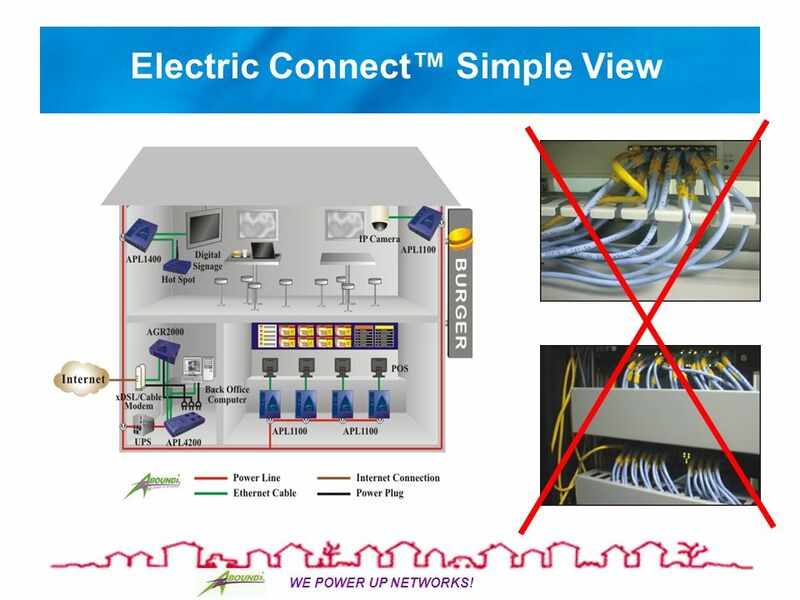 What is Electric Connect®? 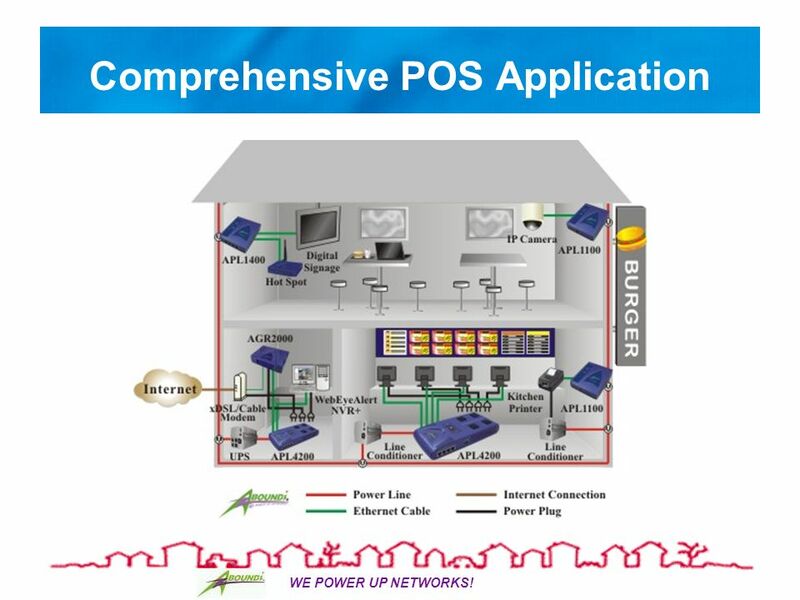 Electric Connect® solution is designed to enable high speed Ethernet packets to traverse over many different transmission mediums: in-premise electrical wiring, voice grade twisted wires and long distance coaxial cables. 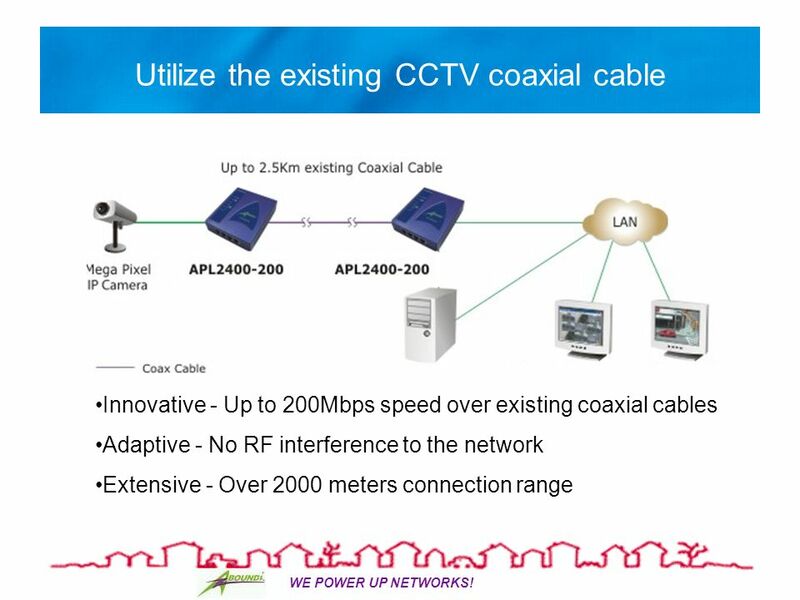 This Virtual CAT5' capability allows us the vast opportunities of solving many physical networking infrastructure connectivity deployment related problems cost effectively, hence, lower the Total Cost of Ownership (TCO). 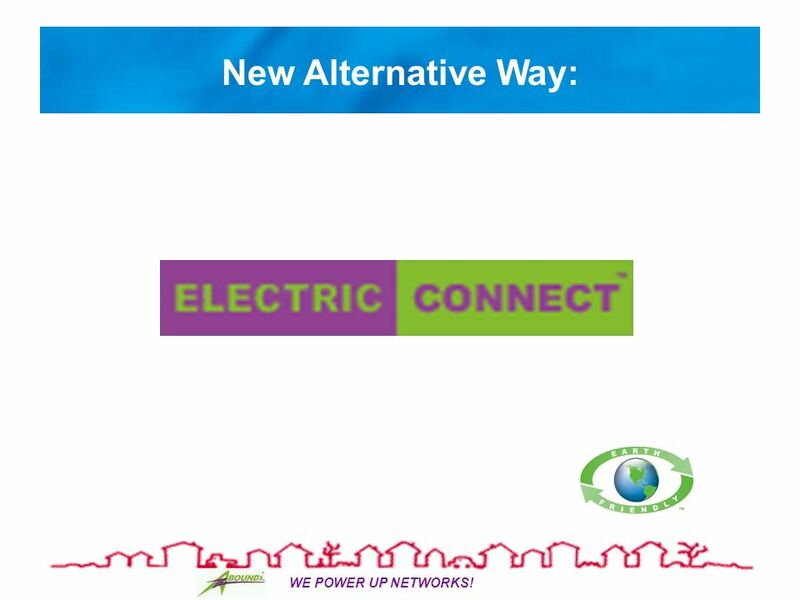 WE POWER UP NETWORKS®! 5 WE POWER UP NETWORKS! 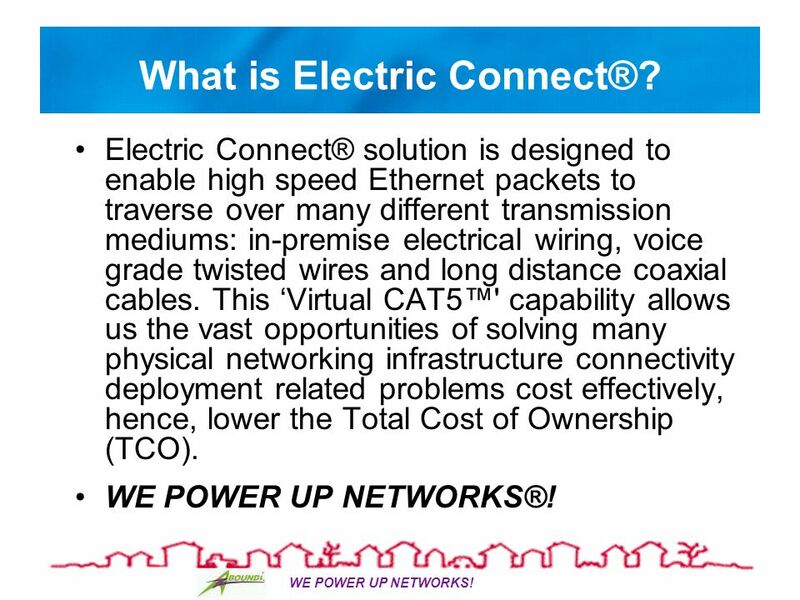 Why Electric Connect® ? 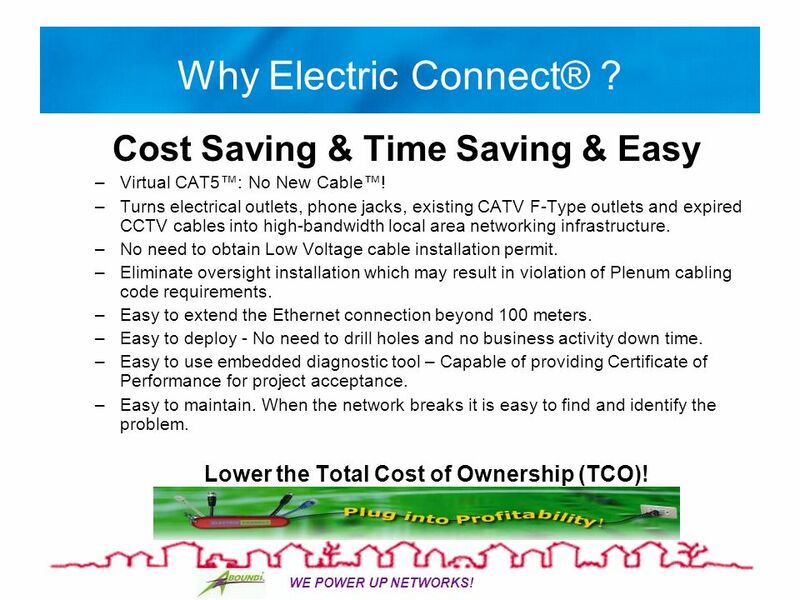 Cost Saving & Time Saving & Easy –Virtual CAT5: No New Cable! –Turns electrical outlets, phone jacks, existing CATV F-Type outlets and expired CCTV cables into high-bandwidth local area networking infrastructure. –No need to obtain Low Voltage cable installation permit. 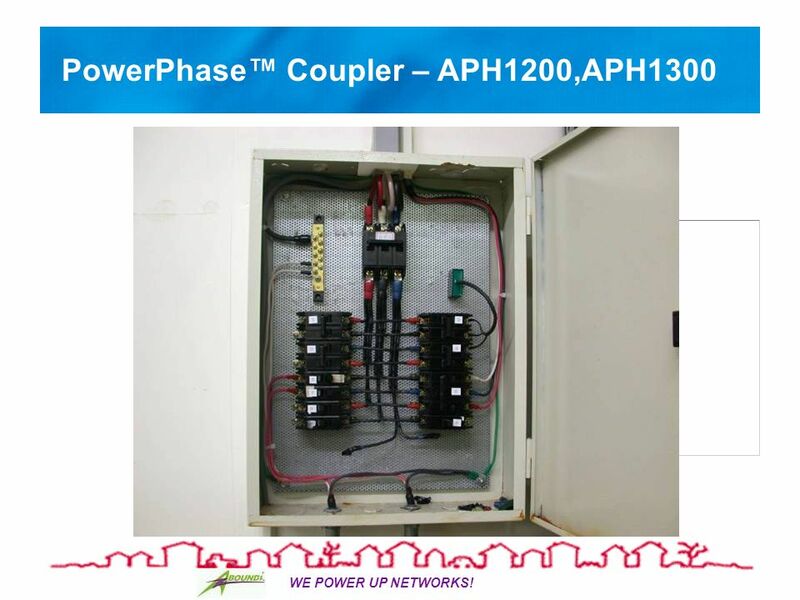 –Eliminate oversight installation which may result in violation of Plenum cabling code requirements. –Easy to extend the Ethernet connection beyond 100 meters. –Easy to deploy - No need to drill holes and no business activity down time. –Easy to use embedded diagnostic tool – Capable of providing Certificate of Performance for project acceptance. –Easy to maintain. When the network breaks it is easy to find and identify the problem. 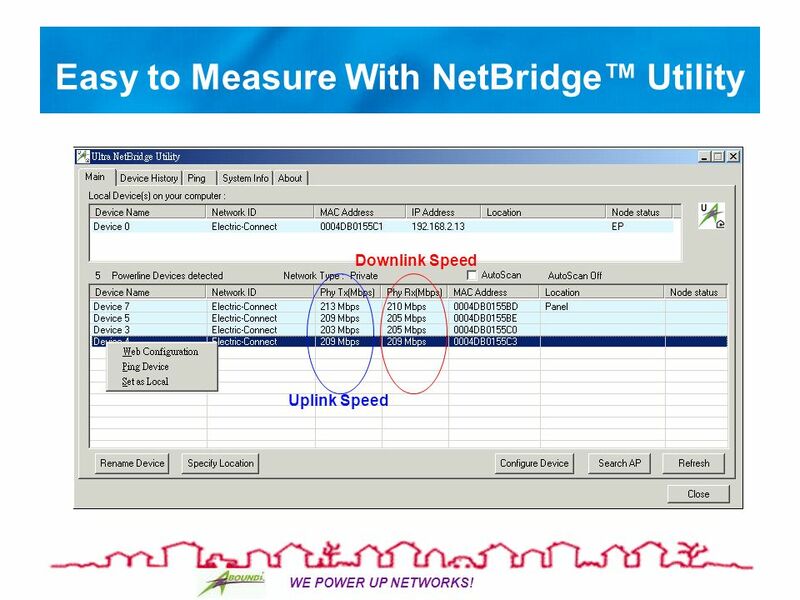 Lower the Total Cost of Ownership (TCO)! 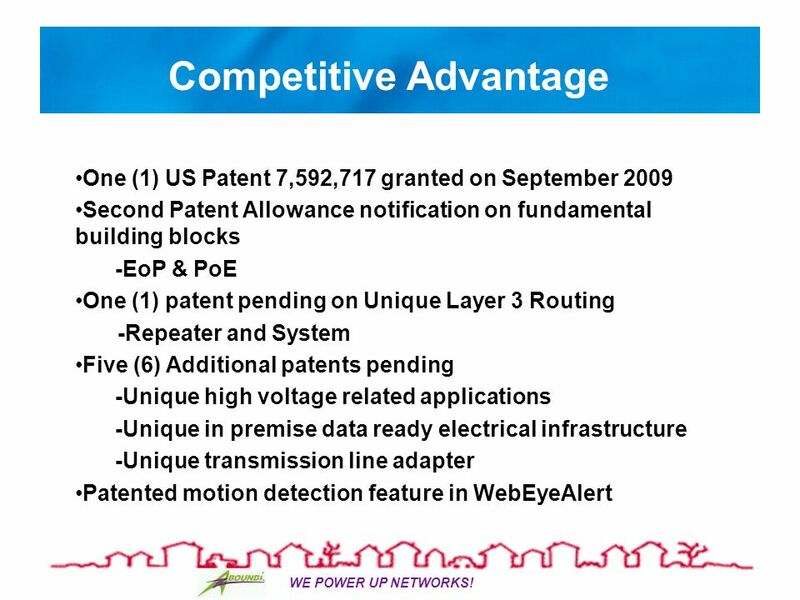 8 WE POWER UP NETWORKS! 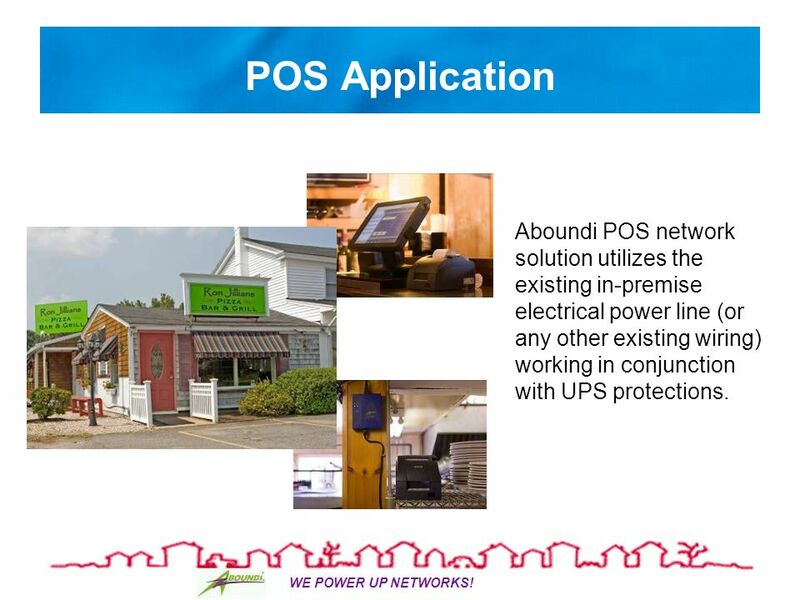 POS Application Aboundi POS network solution utilizes the existing in-premise electrical power line (or any other existing wiring) working in conjunction with UPS protections. 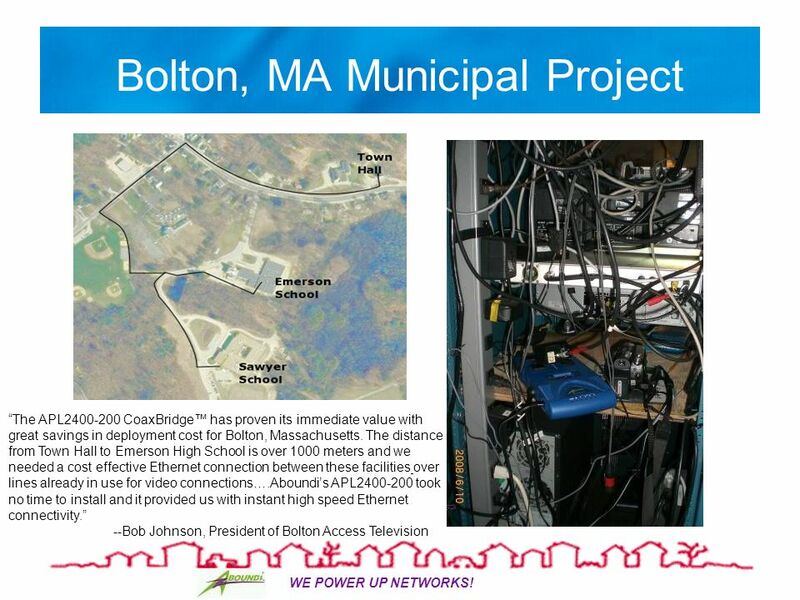 10 WE POWER UP NETWORKS! 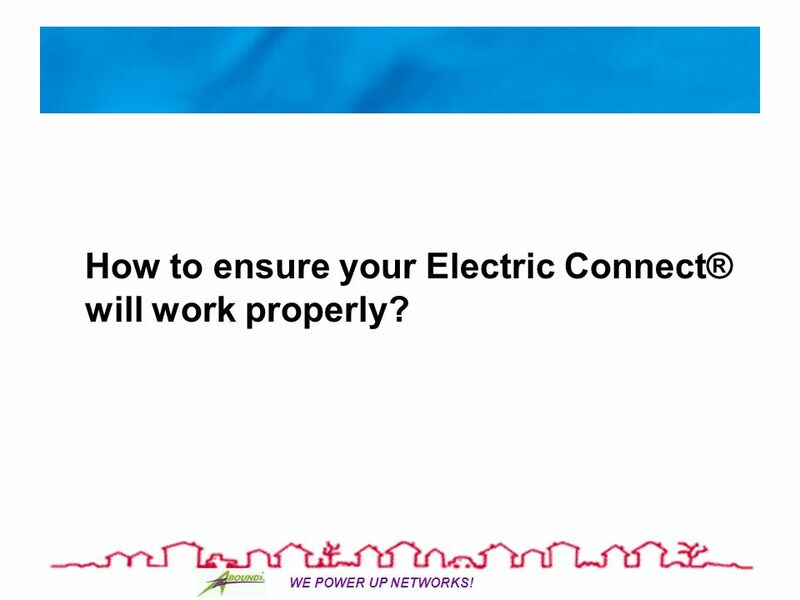 How to ensure your Electric Connect® will work properly? 11 WE POWER UP NETWORKS! Initial Site Survey 1.Is there only one electric meter at the site? 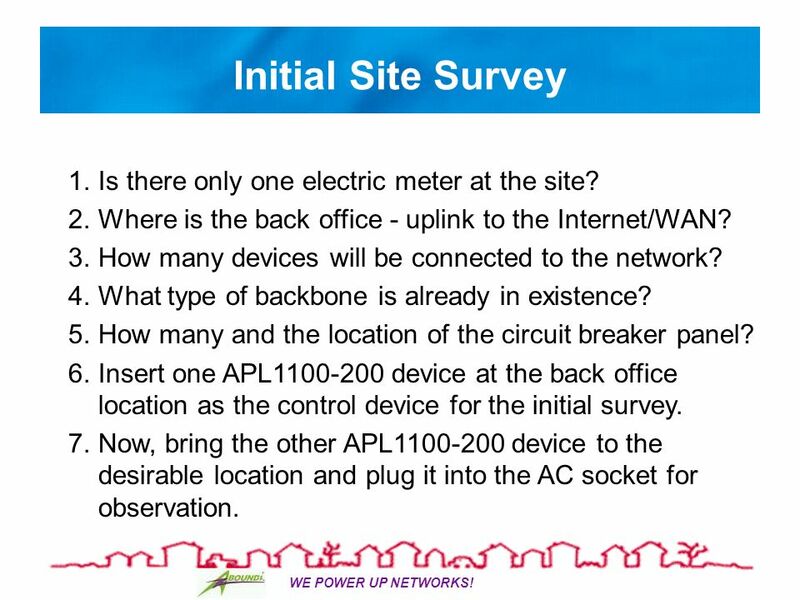 2.Where is the back office - uplink to the Internet/WAN? 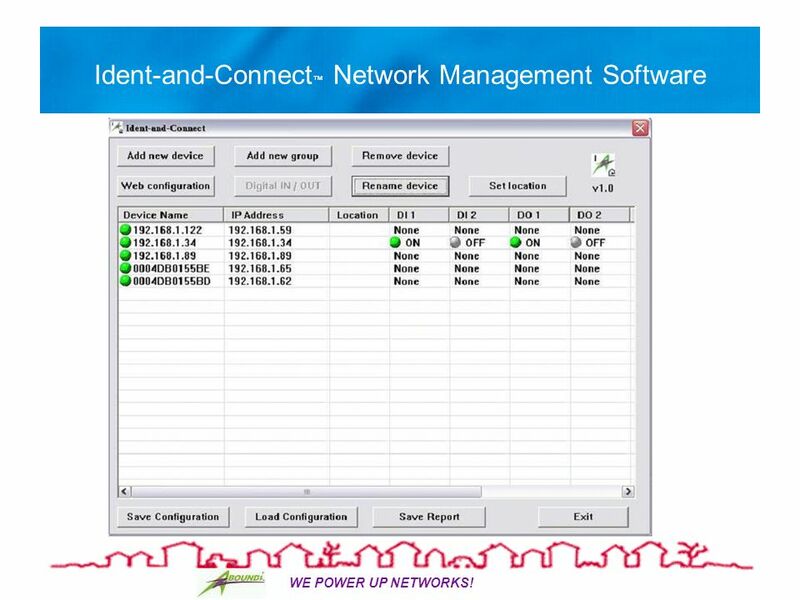 3.How many devices will be connected to the network? 4.What type of backbone is already in existence? 5.How many and the location of the circuit breaker panel? 6.Insert one APL1100-200 device at the back office location as the control device for the initial survey. 7.Now, bring the other APL1100-200 device to the desirable location and plug it into the AC socket for observation. 12 WE POWER UP NETWORKS! 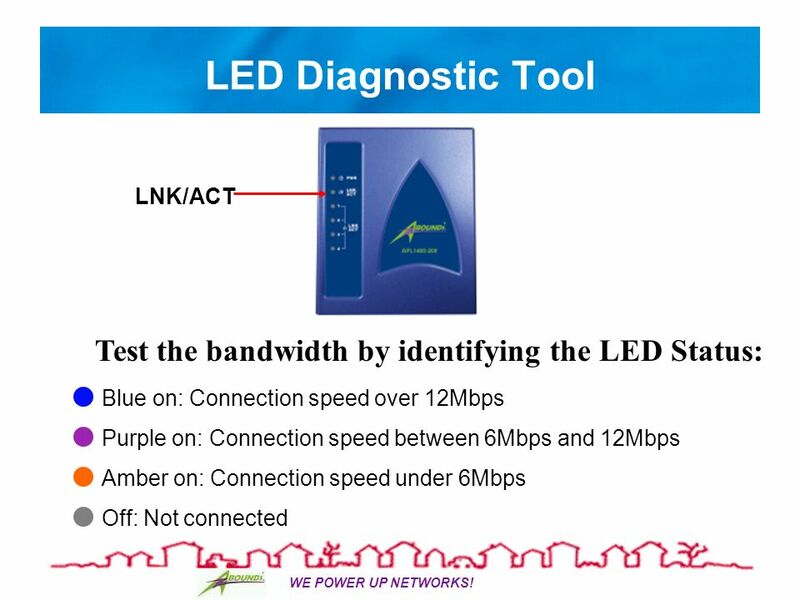 Network Deployment Tool The LED color indication will provide a good feedback regarding the operational status of the connection. 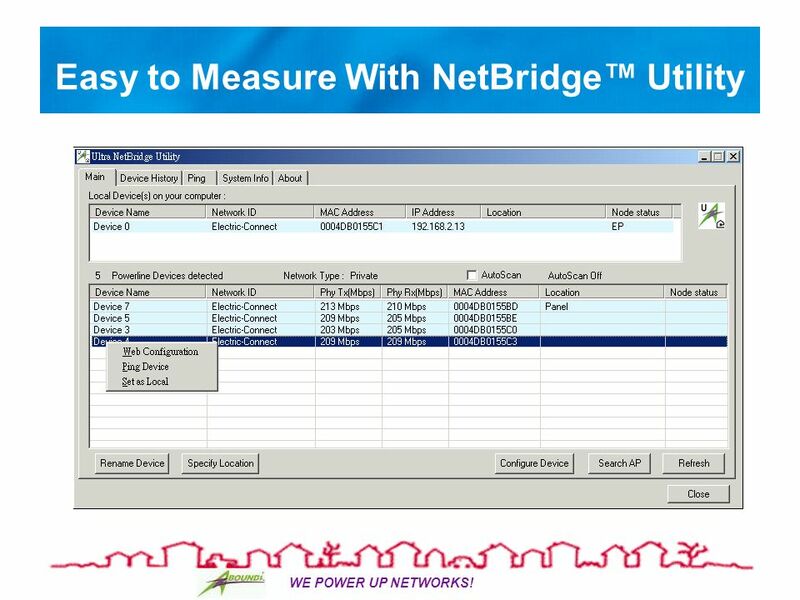 Always use the NetBridge Utility during initial system deployment to ensure a good performance data for future reference. 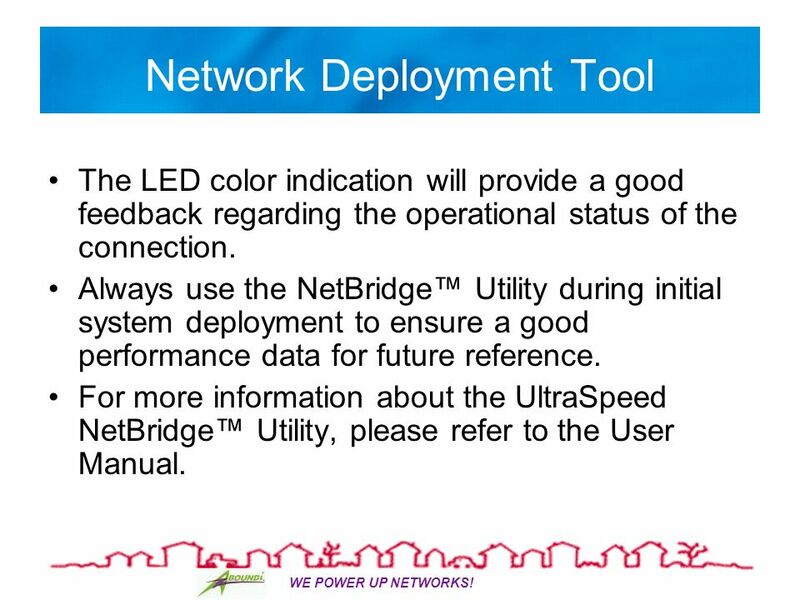 For more information about the UltraSpeed NetBridge Utility, please refer to the User Manual. 16 WE POWER UP NETWORKS! 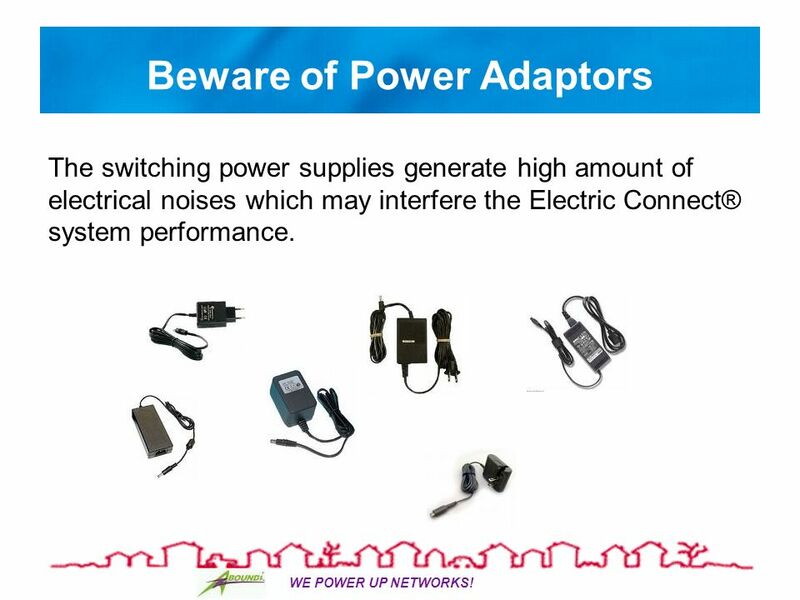 Beware of Power Adaptors The switching power supplies generate high amount of electrical noises which may interfere the Electric Connect® system performance. 17 WE POWER UP NETWORKS! 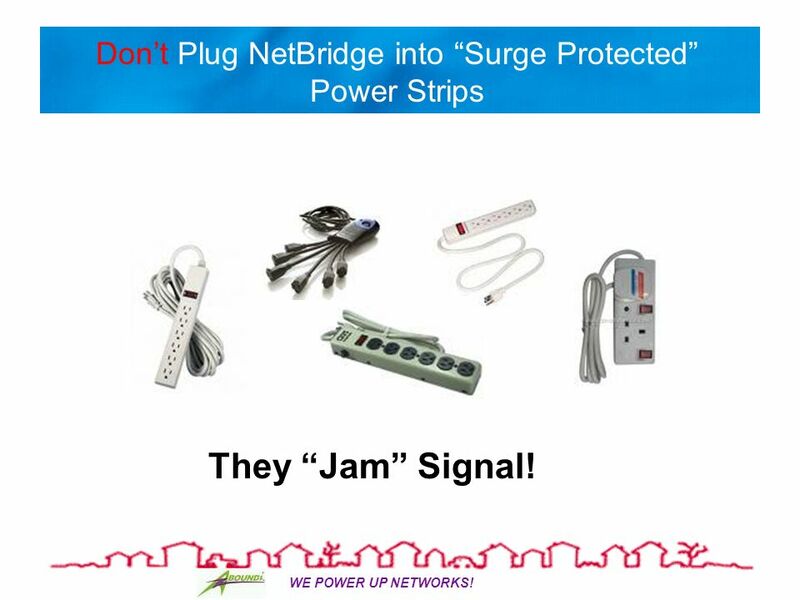 Dont Plug NetBridge into Surge Protected Power Strips They Jam Signal! 18 WE POWER UP NETWORKS! 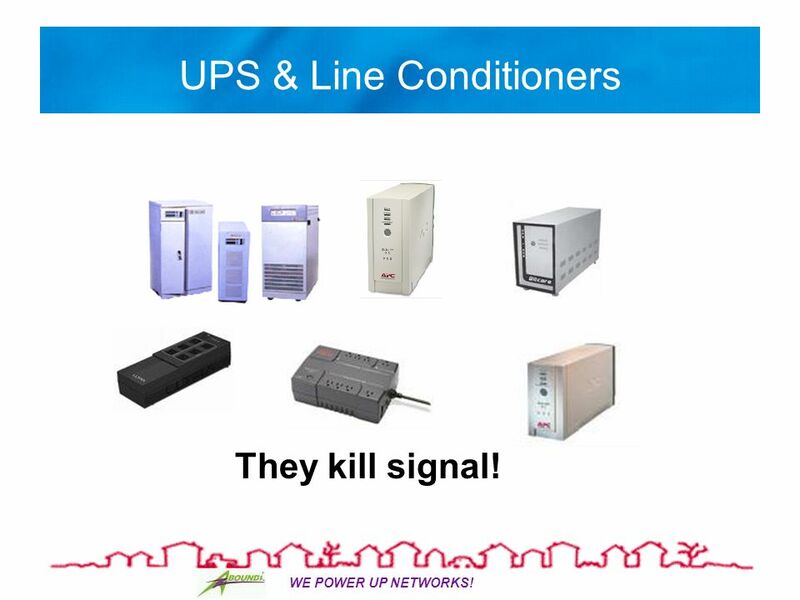 UPS & Line Conditioners They kill signal! 19 WE POWER UP NETWORKS! IMPORTANT! 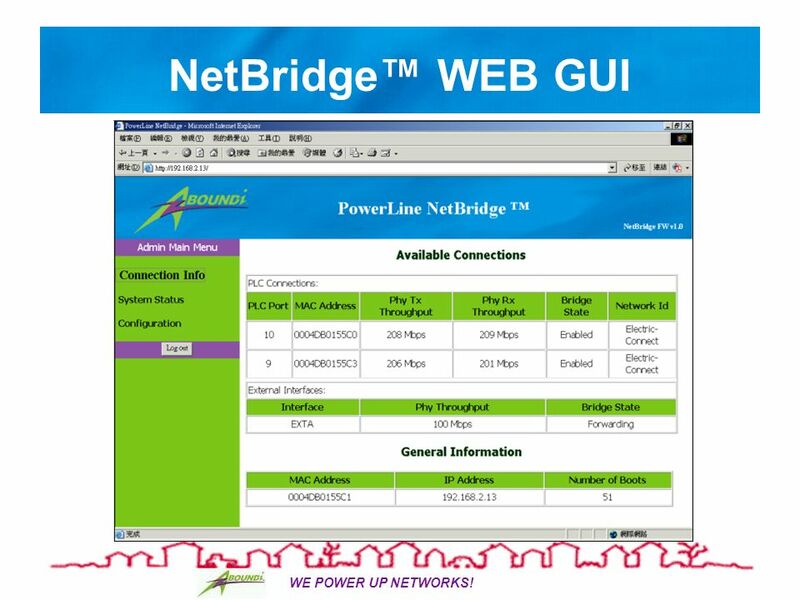 DONT place NetBridge behind the UPS or Surge Protection outlet. 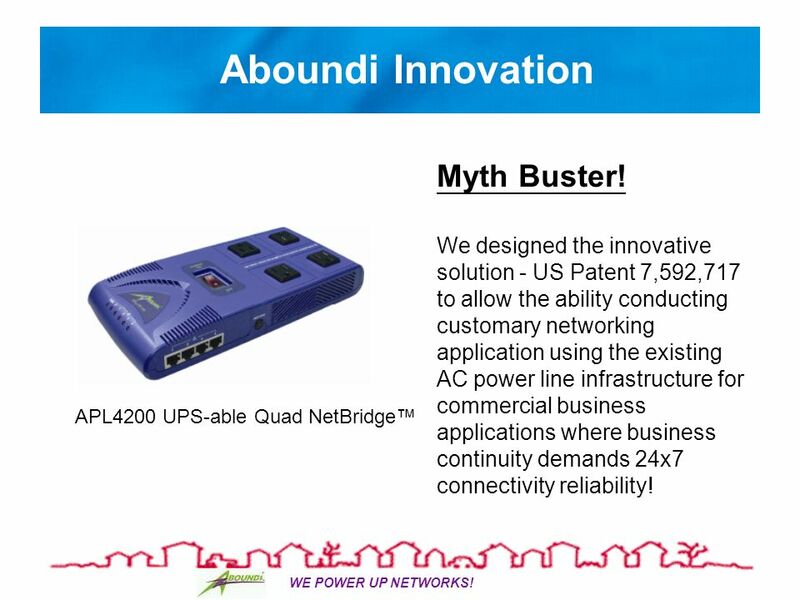 Solution: Use patented APL4200 UPS-able NetBridge. 25 WE POWER UP NETWORKS! 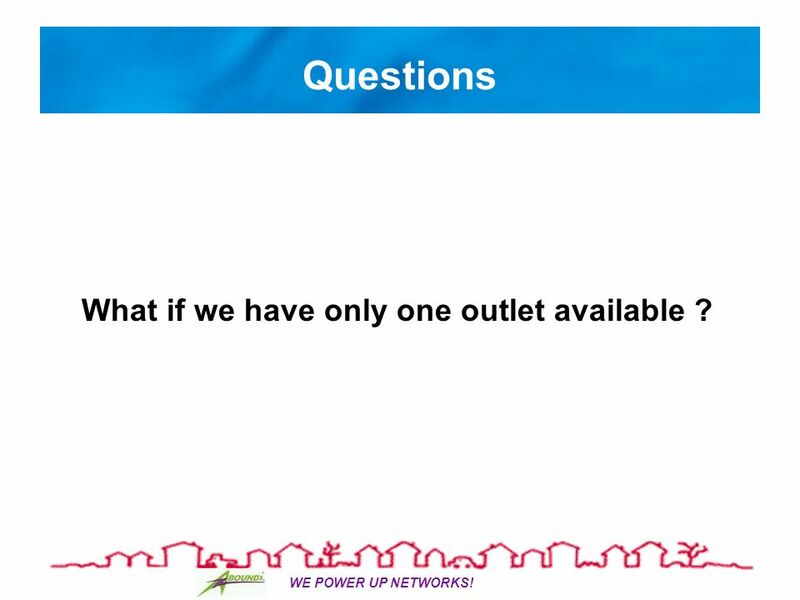 Questions What if we have only one outlet available ? 26 WE POWER UP NETWORKS! 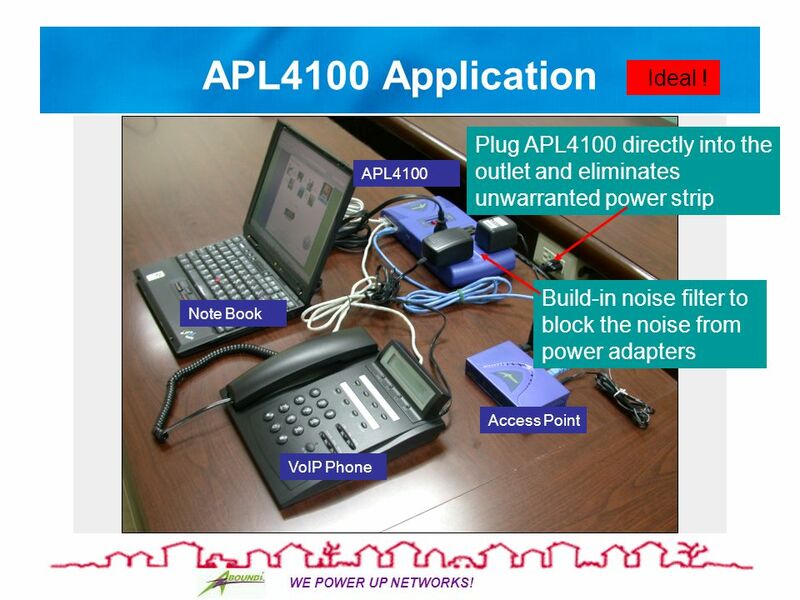 APL4100 Application Plug APL4100 directly into the outlet and eliminates unwarranted power strip Build-in noise filter to block the noise from power adapters Note Book VoIP Phone Access Point APL4100 Ideal ! 27 WE POWER UP NETWORKS! 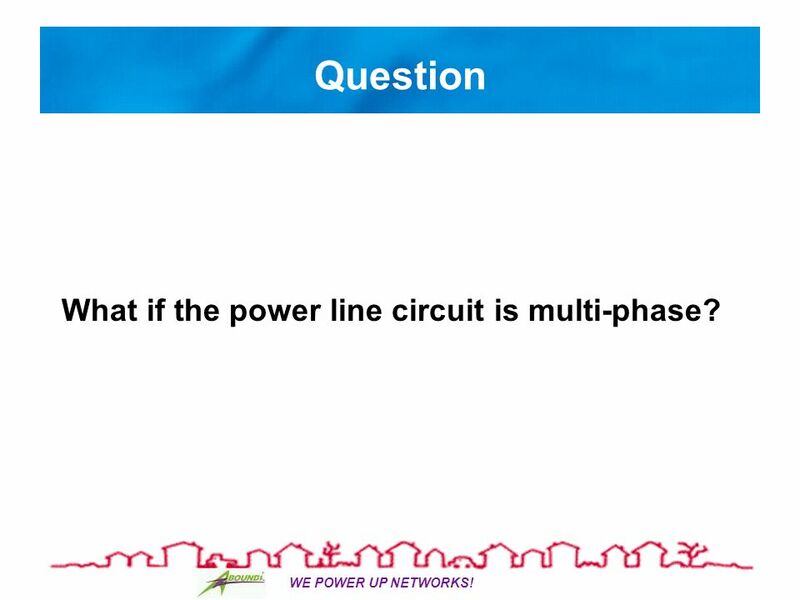 Question What if the power line circuit is multi-phase? 30 WE POWER UP NETWORKS! 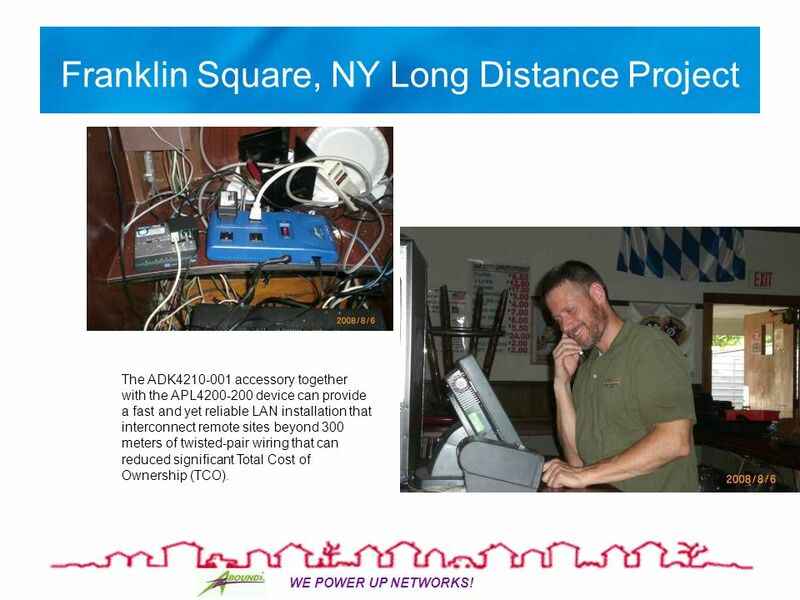 Franklin Square, NY Long Distance Project The ADK4210-001 accessory together with the APL4200-200 device can provide a fast and yet reliable LAN installation that interconnect remote sites beyond 300 meters of twisted-pair wiring that can reduced significant Total Cost of Ownership (TCO). 31 WE POWER UP NETWORKS! 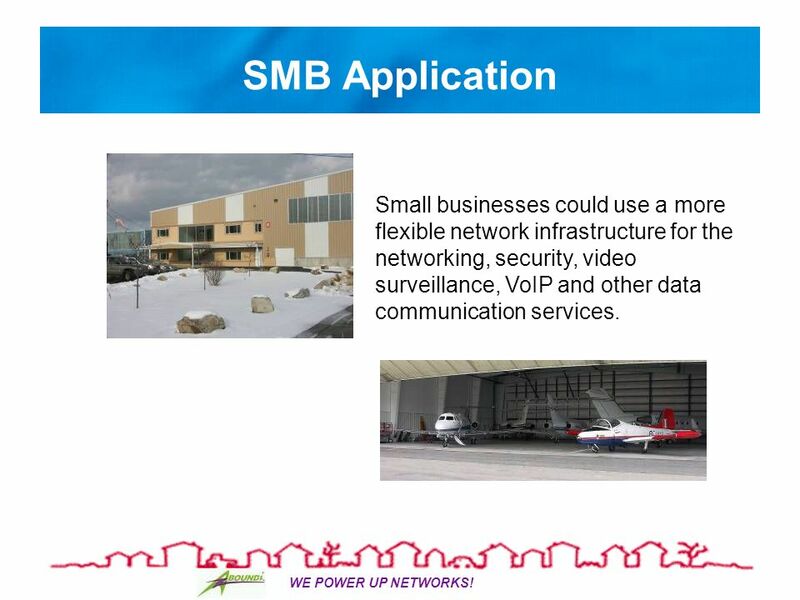 SMB Application Small businesses could use a more flexible network infrastructure for the networking, security, video surveillance, VoIP and other data communication services. 34 WE POWER UP NETWORKS! 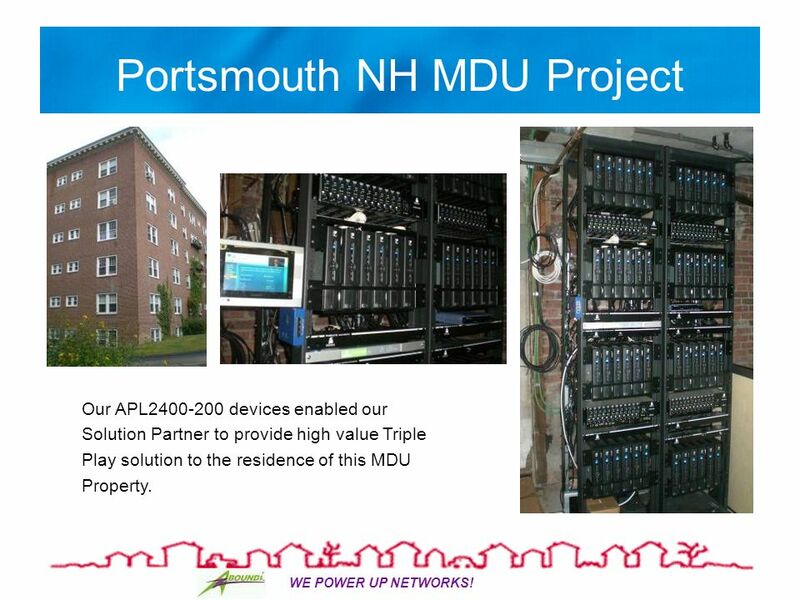 Portsmouth NH MDU Project Our APL2400-200 devices enabled our Solution Partner to provide high value Triple Play solution to the residence of this MDU Property. 35 WE POWER UP NETWORKS! 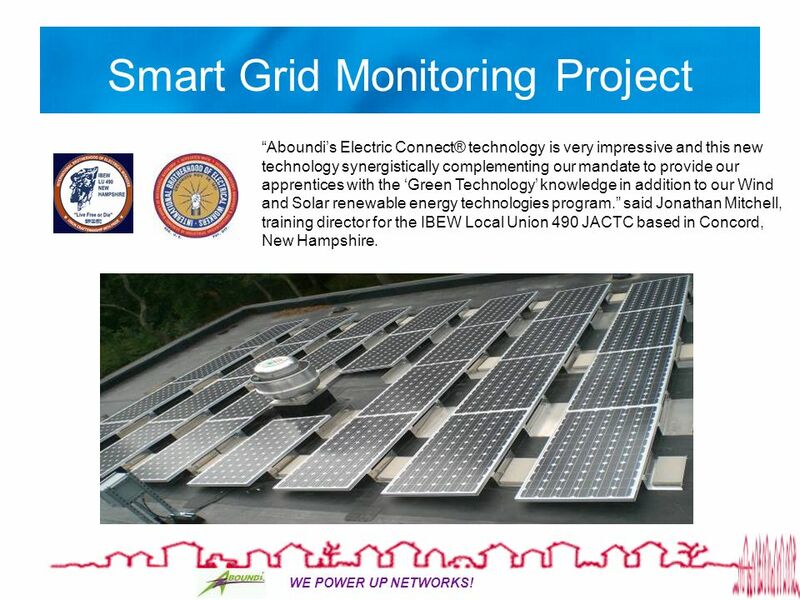 Smart Grid Monitoring Project Aboundis Electric Connect® technology is very impressive and this new technology synergistically complementing our mandate to provide our apprentices with the Green Technology knowledge in addition to our Wind and Solar renewable energy technologies program. said Jonathan Mitchell, training director for the IBEW Local Union 490 JACTC based in Concord, New Hampshire. 36 WE POWER UP NETWORKS! 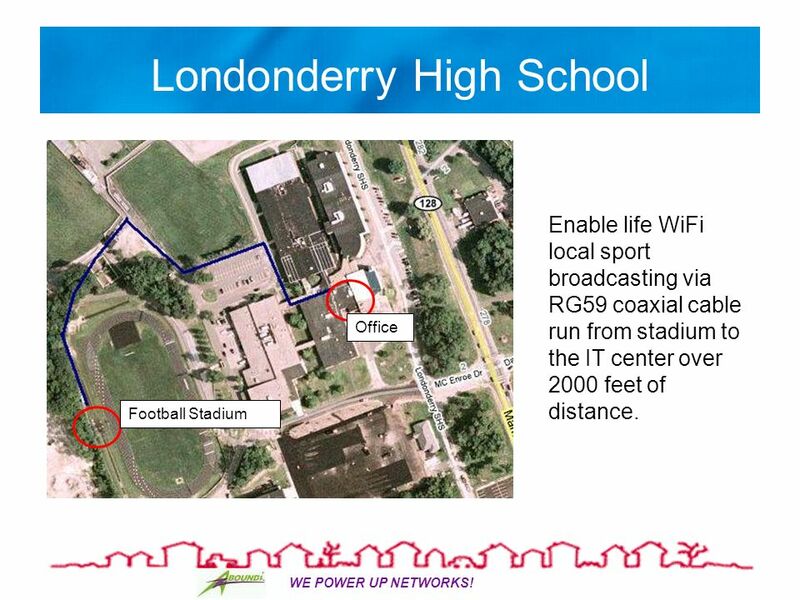 Londonderry High School Football Stadium Office Enable life WiFi local sport broadcasting via RG59 coaxial cable run from stadium to the IT center over 2000 feet of distance. 41 WE POWER UP NETWORKS! 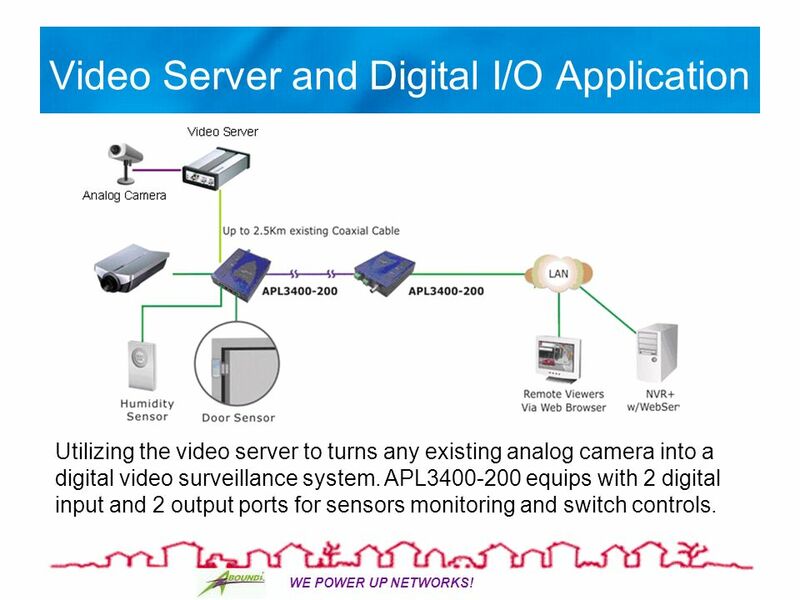 Video Server and Digital I/O Application Utilizing the video server to turns any existing analog camera into a digital video surveillance system. 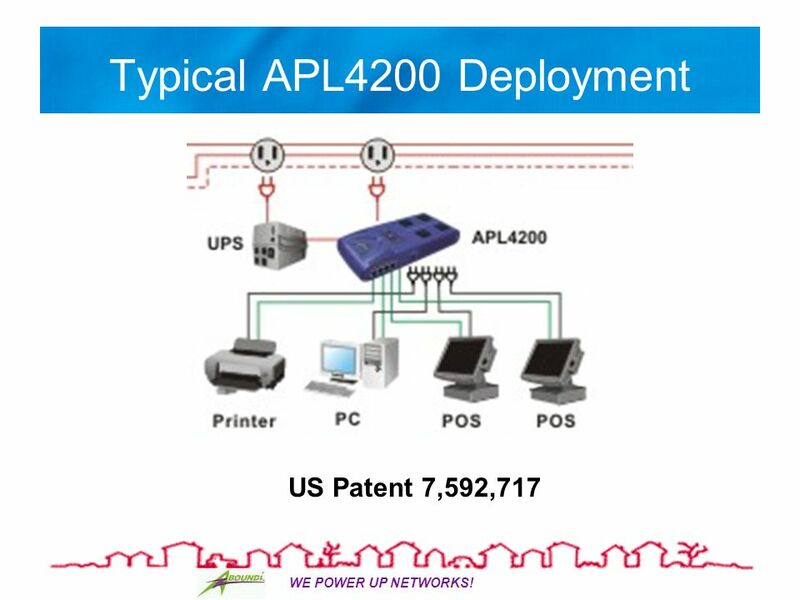 APL3400-200 equips with 2 digital input and 2 output ports for sensors monitoring and switch controls. 42 WE POWER UP NETWORKS! 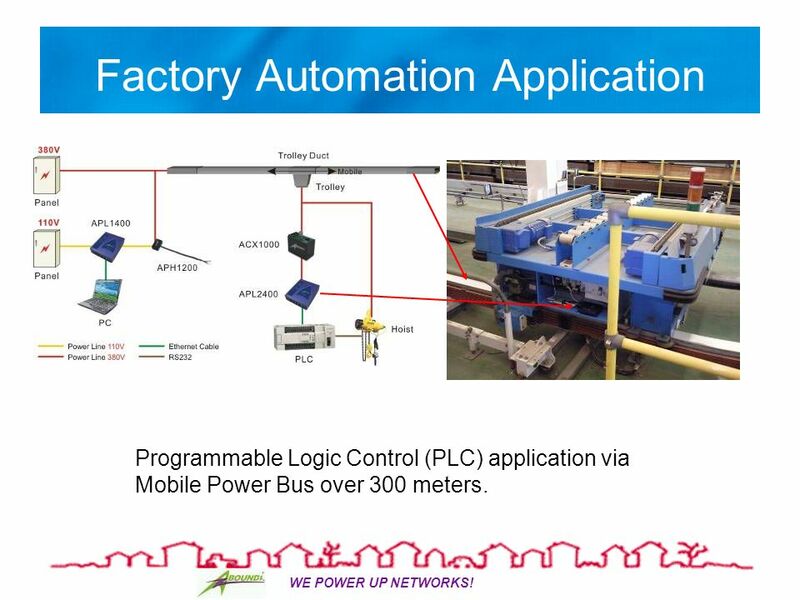 Factory Automation Application Programmable Logic Control (PLC) application via Mobile Power Bus over 300 meters. 44 WE POWER UP NETWORKS! Commercial Quality Aboundi design and manufactures equipments for the commercial applications. We provide professional technical support to our customers. 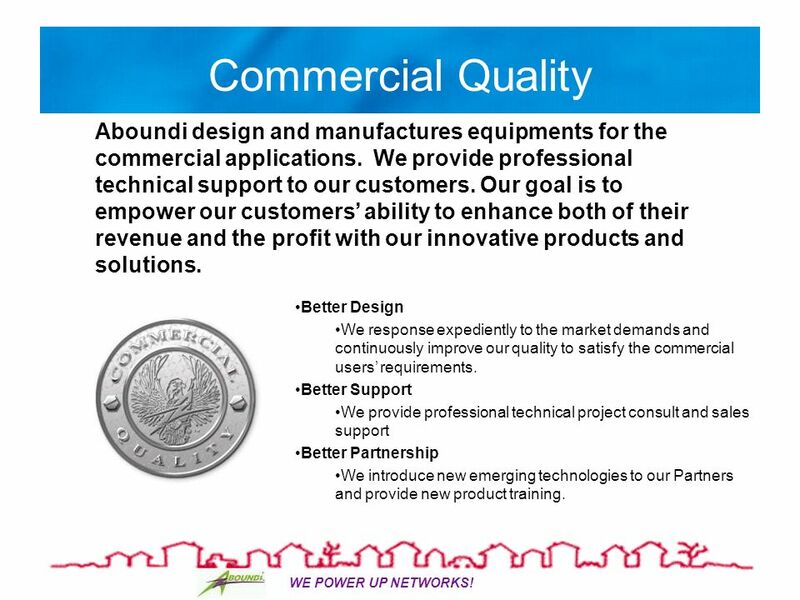 Our goal is to empower our customers ability to enhance both of their revenue and the profit with our innovative products and solutions. Better Design We response expediently to the market demands and continuously improve our quality to satisfy the commercial users requirements. Better Support We provide professional technical project consult and sales support Better Partnership We introduce new emerging technologies to our Partners and provide new product training. 45 WE POWER UP NETWORKS! Thank you! 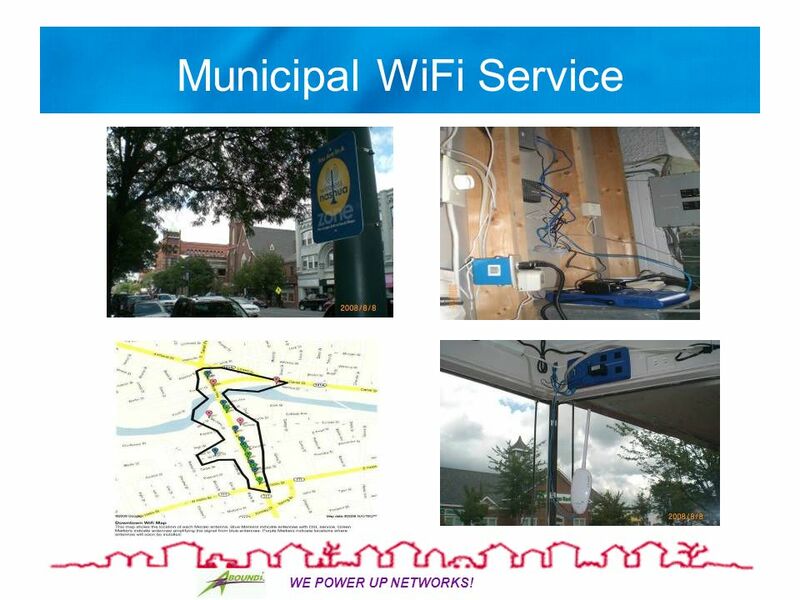 Download ppt "WE POWER UP NETWORKS! 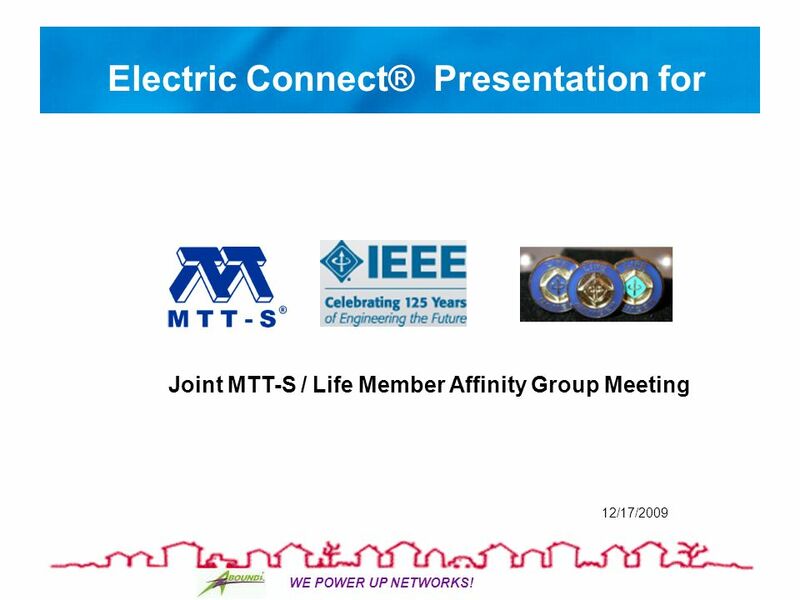 Electric Connect® Presentation for 12/17/2009 Joint MTT-S / Life Member Affinity Group Meeting." 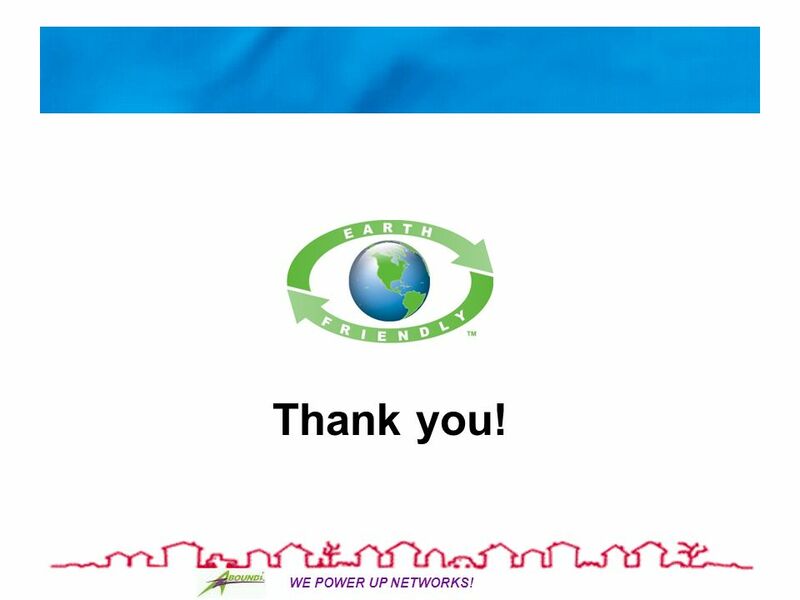 Networks Unit 3 & 4 IP&M JEOPARDY Acknowledgements: VITTA for the jeopardy pro-forma Mark Kelly’s Network slideshow. Chapter VI Data Communication: Delivering Information Anywhere and Anytime By: AP CHEN P. JOVER BSIT - III. 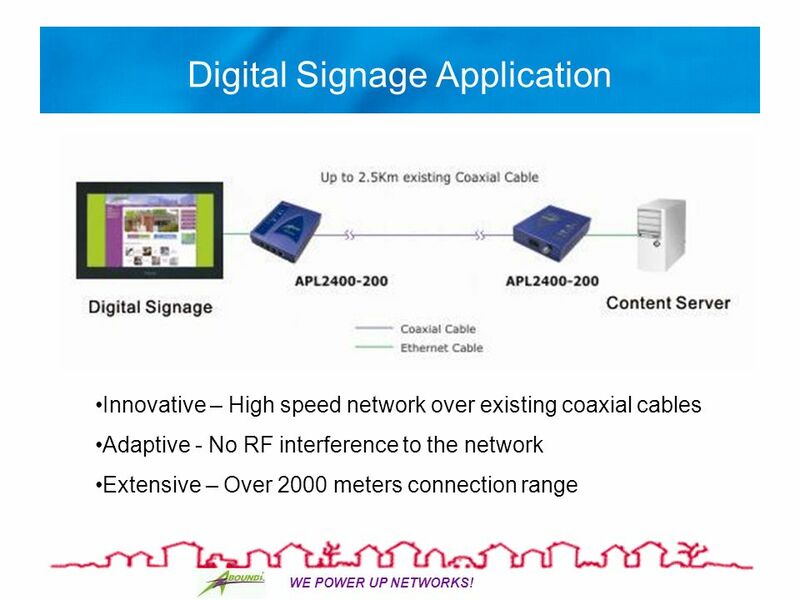 4G Technology Presented By Nithin Raj. 4G Definition 4G is not one defined technology or standard, but rather a collection of technologies at creating. 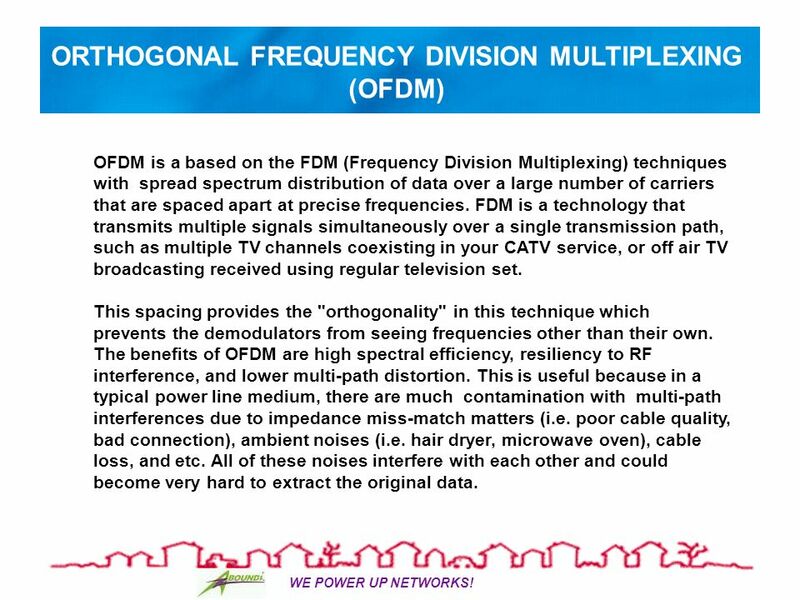 Chapter 6 Telecommunications & Networks. 1 Copyright © 2011 Pearson Education, Inc. Publishing as Prentice Hall. A Probe into Basic Telephony and Telecommunications Jon F. Johnson Extension Area Specialist Virginia Cooperative Extension. “ Getting to Know Networks”. What Is a Network? 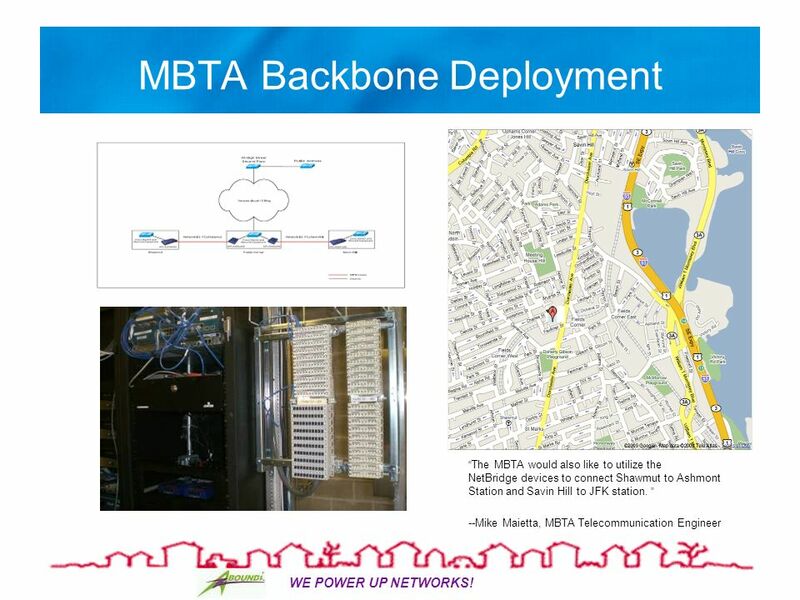 A network is a collection of computers hooked up together, usually by cables or telephone wires, for the.